Mike Wilder delivers Rip It for National Beverage Co., parent company of Faygo. When Mike Wilder showed up before a Faygo Book talk at the library in Gladwin, Michigan, I knew something was up. 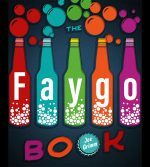 For one thing, he already had a Faygo Book. For another, he was wearing a jacket that said Rip It, a brand belonging to Faygo’s parent company, National Beverage Co.
Wilder asked if I would sign his book. I asked where he had gotten it. He said the company had given it to him for Christmas. I suspected as much and told him to look inside. Sure enough. His book was already signed. Faygo had ordered 300 as gifts for employees, and I had driven to Wayne State University Press to sign them. This was one. So, I signed the page a second time and wrote, “To Mike, the only guy who knows why this book has two signatures.” And now you know why, too.